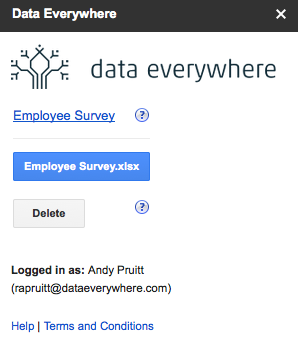 This article will help you set up automatic publishing of data submitted in a Google Form to a Data Everywhere Feed. The Data Everywhere Forms add-on provides a convenient link to have Forms submissions data immediately in Excel. Data Everywhere provides an Excel Add-in (an Add-IN program that is installed inside of Excel) that allows your existing spreadsheet to update itself as soon as new data becomes available from Forms. The new data will appear directly inside of the spreadsheet that you have stored on your local computer; no web browser is needed. Data Everywhere will create a feed with the same name as your form upon the first submission after enabling the add-on. New rows will be added immediately after each form submission. The automatic publishes are all run from Google's servers, so there is no need to have the form or results spreadsheet open, or even be logged in to Google or have your computer turned on for them to work. This is a great way to sync your Google Forms responses into Excel automatically. Install the Forms add-on from the Forms Add-On store. Install the Excel add-in. You can download it from here. Restart Excel and log in to Data Everywhere through the add-in. Click the "Insert" button on the Data Everywhere toolbar in the Excel Ribbon. Your Forms data will be available as a data feed that is automatically updated within this spreadsheet.